I have to admit that I was late to The Hunger Games party. Friends had been reading the books for years, but I've had my head stuck in non-fiction space books for so long, fiction just passed right by me. My 11-year-old daughter started begging to read the trilogy, and I decided that - based on what I'd heard about the violence in the book - I needed to read them with her so I could make sure it was appropriate for her. I read the first book in less than 24 hours. That week, aside from the normal work and family tasks, I luxuriated in devouring the whole trilogy. Reading a good book is absolutely blissful, and I loved how this story sucked me right in and wouldn't let go until I turned the very last page of Mockingjay. My daughter also devoured The Hunger Games (though she's going through Catching Fire more slowly) and we have had so much fun discussing the books. We fight over the whole Team Peeta/Team Gale thing, talk about how Katniss' awesomeness knows now bounds, and discuss if she thinks something like this could ever happen in real life. It's been a wonderful way to connect with each other, and if you are a parent to a pre-teen ... you know how much it means to find something to connect with. We have our tickets to see the movie tonight, and have a whole date night planned. She mentioned wanting a shirt, but of course I thought, "Why buy when I can DIY?" 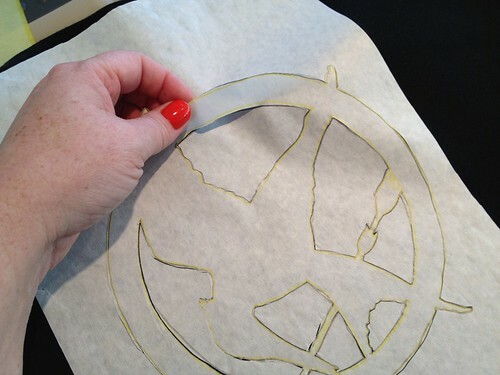 I posted a Hunger Games craft roundup on CRAFT last week, and one of the projects included a template for the Mockingjay pin. 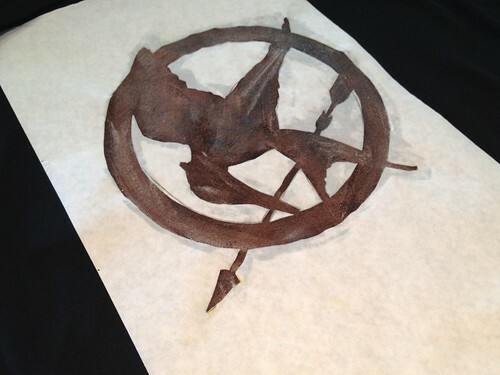 I decided a simple bleach pen/freezer paper stencil on black t-shirts would be easy and would give us that gritty Hunger Games feel. We may look like total nerds wearing mother/daughter Hunger Games t-shirts, but if she's game for it, I will not pass up the opportunity. Who knows when she'll be willing to do this ever again! 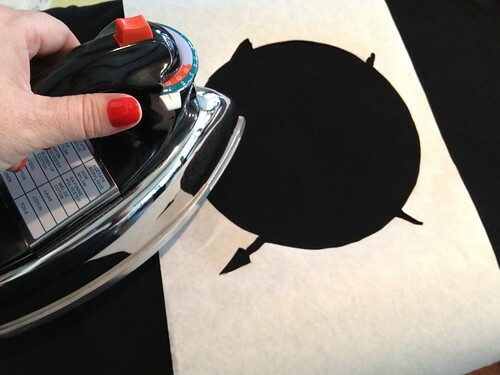 Bleach pen/freezer paper stencils are insanely easy, quick and inexpensive. 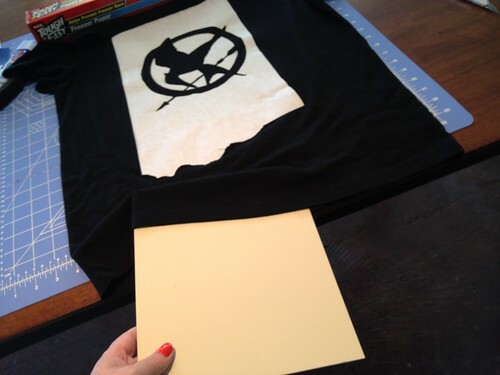 Here's all you need to make your own Mockingjay t-shirt to wear to the movie this weekend. 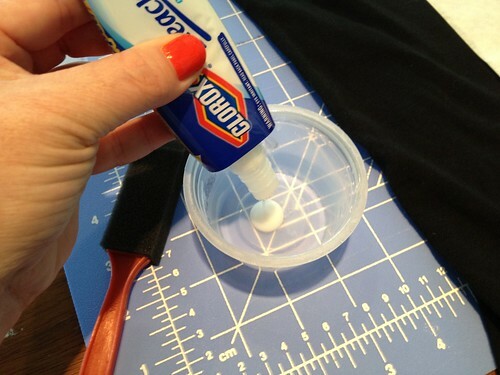 Once you have the supplies on hand, you can easily be done with your shirt in 30-40 minutes. 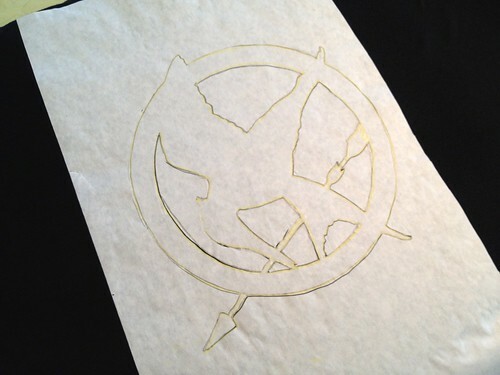 Step Two: Use a pencil to trace the Mockingjay design on to the rough side of the freezer paper. Step Three: Remove the freezer paper from the window and place it on a self-healing cutting mat (a piece of cardboard will work in a pinch. 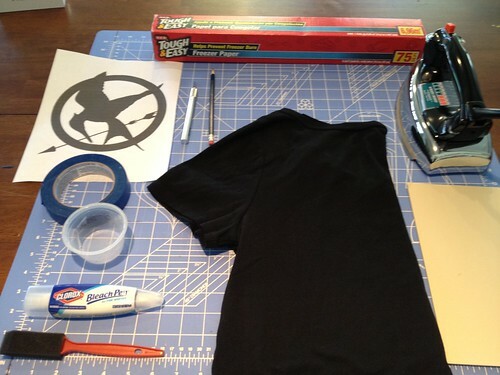 You just want to protect the surface on which you are cutting) Carefully cut out all the inside pieces of the Mockingjay design that you will want to keep black in your design. Then cut out on the outside line of the circle/arrow. Be sure to keep the outer large piece of the freezer paper in tact. SAVE all the small inside pieces. 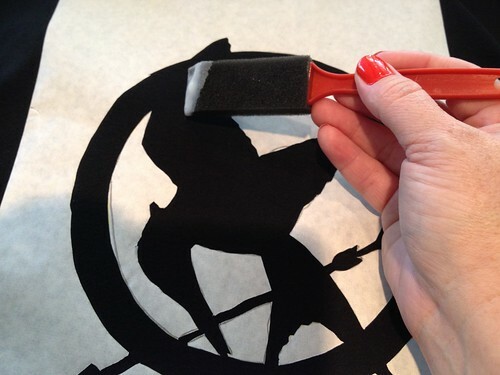 You'll need them for the stenciling. Step Four: Iron the large outer pice of freezer paper on to your shirt where you want the design to go. 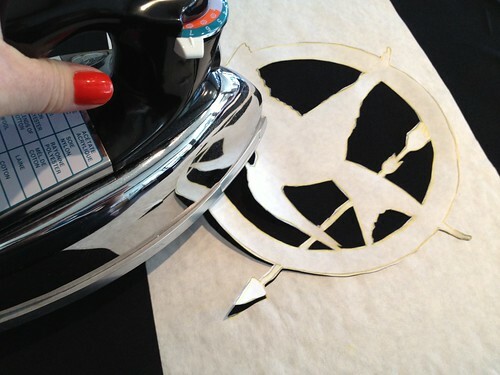 Use a hot, dry iron and press well. the paper gets a little wobbly-looking. That's ok. 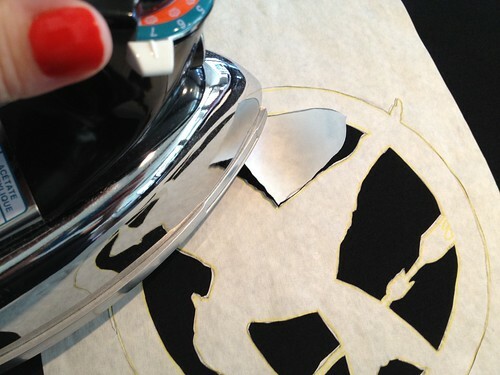 Step Five: Place the Mockingjay portion of the cutout carefully in place inside the circle and press down. Step Six: Take all the small inside pieces and iron them in to place. Things can get a bit fiddly at this point, but keep in mind: it doesn't have to be perfect. Step Seven: Once all the pieces of the freezer paper are down, it's time to remove the pieces you want to bleach (thank you to my pal, Kathie, for this easy tip on getting the reverse of the design to work!) 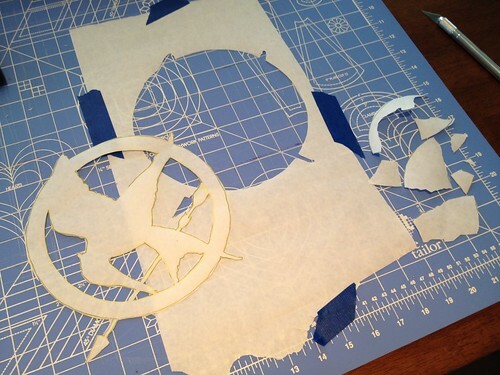 Carefully peel back the pieces of the Mockingjay pin portion of the design, leaving you with the large outer piece and all the small inside pieces. Step Eight: Slide a piece of scrap cardboard inside your shirt to prevent the bleach from bleeding through to the back. 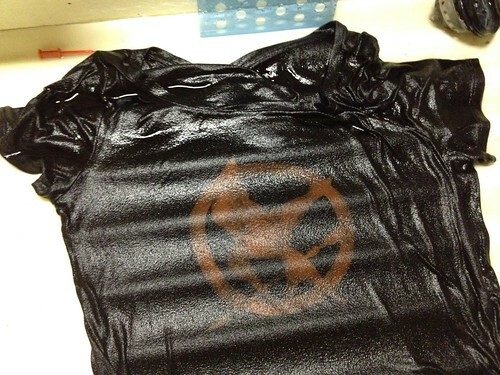 Step Ten: Use a small foam sponge brush to paint the gel on to the t-shirt inside your design. Step Eleven: Make sure the design is fully coated and let it sit for a few minutes. You'll see it start to change colors. I'd say anywhere from 5-8 minutes is good enough to bleach it out, but not so long that it will severely damage the fabric. Be sure to keep an eye on it and judge based on your own shirt. Step Twelve: Very carefully peel back the pieces of the freezer paper, starting with the small inside pieces. Be sure to not allow the shirt to pull up and fold back on itself, causing the bleach gel to transfer to other parts of the shirt. Step Thirteen: Immediately rinse the t-shirt in the sink to stop the bleaching process. Squeeze it out and then wash it in the washing machine and you're ready to wear it to see the movie! This is such a quick, easy and accessible project, and the method can be applied to any design. Give it a try and let me know how it goes! Wait, she's ELEVEN and she needs your permission to read a book? I'm so glad my parents were born before 1970 . . .
She said she wanted to read them with her. Not instead. Not before. With. There are so many great things in the book to discuss - social justice, revolution, personal responsibility. It's a great book to read with your kid. And yes, when my daughter said, "I'm reading a book where a group of kids is selected to fight to the death with only one survivor" I also decided to pick it up in case there were questions. And I'm so glad I did, because it's such an awesome series! We're totally making the shirts, Rachel, thanks for the great idea! @undeadgoat - if you'd read the books and you had an eleven-year-old you'd know why. @undeadgoat: You know, I'm not even a father, but I wouldn't classify this as a young adult novel, just saying. It's marketed as a "Young Adult" novel because that's where it will make the most money. Scholastic WANTED to bring in the Fan Base from Twilight and Harry Potter, both VERY successful young adult novels(Even though I'd even question Twilight, but whatever). And BECAUSE I wouldn't classify it as a young adult novel is why I would question the level of violence for a younger child. That being said, I think AJC did the right thing reading them with her daughter. Because yes, 11 is a good age to ask permission to read a book, there are all sorts of books that are simply too mature for an eleven year old to read, and depending on the level of maturity rather than age, is what I'd allow a child to read it...If that made sense... haha Also, I apologize for interjecting, but like Lari, I think it's awesome that your daughter talked to you as well, and I think undeadgoat is a troll. And, yes, a whole posse of bleach-shirted kids and moms at the Alamo to see HG would ROCK. Hope y'all had fun at the movie this weekend! You don't know how much I would have LOVED for you to be there (stalker-y or not ;) Just think, in 11 or so years, you can share the books with Owen! So fun! I am completely overwhelmed by your awesomeness. Also, I second what Vickie said: the bleach pen was the perfect choice! You could try using one side of some really sharp scissors or perhaps a box cutter, but it'd be tricky. Xacto knives come in handy frequently, so it's worth investing a few dollars in one. :) All of the items listed here can be found in large discount stores (Target, Walmart) or grocery stores. I hope you try it! Oooh, so awesome! Thanks for posting this. I too have been hearing a lot about Hunger Games. Can't wait to see it. Will you give us a review of it? Have fun at the movies! I will say it was very, very good and did not disappoint for a big fan of the books. It was pretty intense, too, though. Not gory, but just very intense in parts. My daughter spent a good deal of the movie covering her eyes (her choice, not mine) but was otherwise fine with it. I thought they did a great job casting, with the exception of Gale. I'm not typically a big Woody Harrelson fan, but he was great. Jennifer Lawrence was perfect as Katniss. Rue's death left me sobbing. The way they filmed it - from Rue's perspective - was perfect. From the sounds of sniffles in the theater, there weren't many dry eyes during that part. Thanks for the tutorial! I often do freezer paper stencils with paint, and I've discovered you can run freezer paper through an inkjet printer (works for designs smaller than 8.5 x 11 inches, of course). 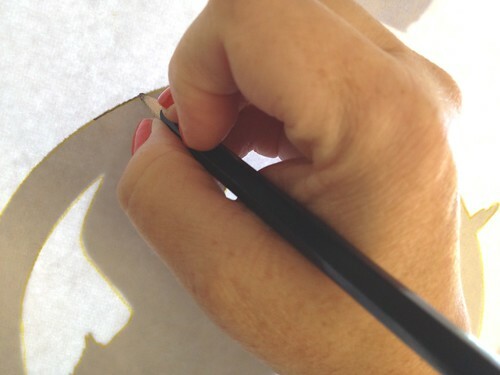 That way you don't have to do the tedious tracing. Cut your freezer paper the same size as a regular sheet of paper, then roll it backwards several times to get it as flat as possible. Make sure you put it in the printer tray so it prints on the paper side, not the shiny side. Sometimes it gets stuck, especially if you didn't cut it straight. Works most of the time, though! Thanks for the tip! Typically, the designs are pretty simple and don't require a lot of tracing, but for more detailed ones the printer can be a big help! Here's a related freezer paper/printer tip: if you cut your freezer paper to the size of a standard sheet of paper and then iron it on to a piece of fabric (standard quilting cotton works best) and cut that to the size of the freezer paper, you can run it through your inkjet printer and print on the fabric! It's a lot of fun! Hmm ... I think regular bleach might work, but you'd just have to be very careful. I'm worried that, given how thin it is, it would bleed past the freezer paper. I've seen methods where folks put bleach and water in a spray bottle and spray over stencils. That might work, but it would be a slightly different look. You can also try using dishwasher liquid. Get your generic/store brand of Cascade - make sure it has bleach listed - and try that. I screen printed with dishwasher liquid in a surface design class, and it gave great results. You don't need the expensive brand name stuff, just go cheap! Hope that helps! A lot of negative comments on such an awesome product. This came out really well. I didn't know you could do details with bleach- thanks for the tips! Yes, contact paper would work as well. As long as it sticks and doesn't let the bleach bleed under it - at least not too much! A little would add to the grittiness. As HippieKender says, contact paper might work. Freezer paper is sometimes hard to find at your grocery store, but it's usually there. It just often ends up on the very top shelf or very bottom shelf in the foil/plastic wrap section. Ask someone who works there and they should be able to help you. I have a giant roll, and it's lasted ages (and was just a few bucks!) Freezer paper is so incredibly handy, it's worth tracking down a roll to keep in your craft stash. Here's a post on CRAFT about sourcing freezer paper. Hope this helps! This is great! I'll have to try it out! Wish I'd seen this before I went to the movie with my 41 year old daughter. Yup...I am a 67 year old grandmother and enjoyed the three books. And YES, my daughter wanted to preview the movie (she's read all three also) before her 11 year old daughter see it. Great movie....but only IF you've read the book. W/O reading them, you'd be lost. 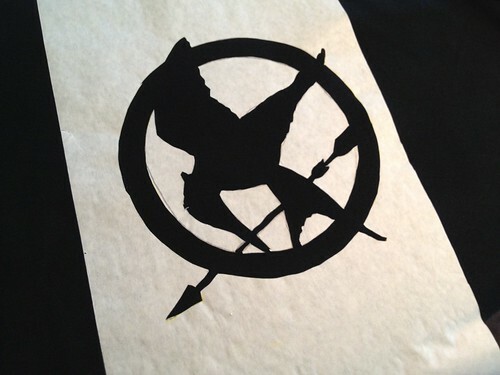 LOVE this Mockingjay Tee shirt idea. Good job. Thanks! How fun that you all read the books together - very cool! Thanks! 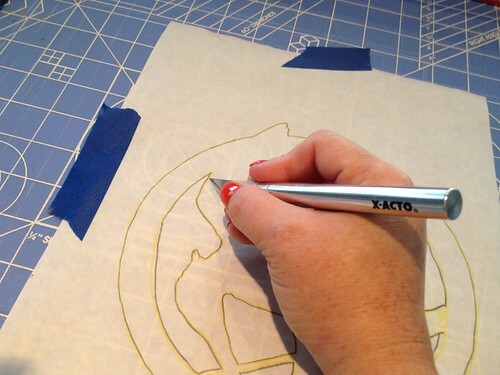 Indeed, Xacto knives are super handy (and cheap!). I hope you had as much fun making your shirts as we did! 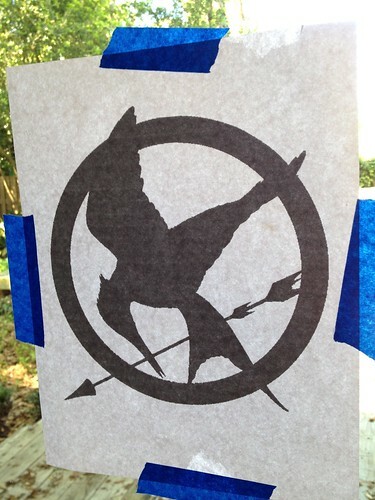 Happy Hunger Games! 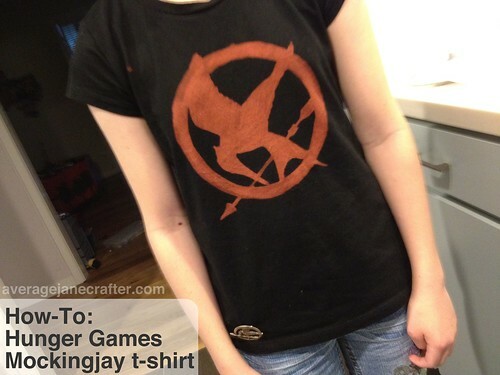 That is an Insanely creative way to make a tshirt! And fits so well with the feel of the books! Might just use this idea in the future, thanks so much!! I love this idea. I wonder if it would work with Clorox toilet cleaner (which is my favorite shower grout cleaner, btw...) - I always have that around, and you get a lot of it for $2. What do you think? Might that work? I love hunger games!! But then again, who doesn't haha. 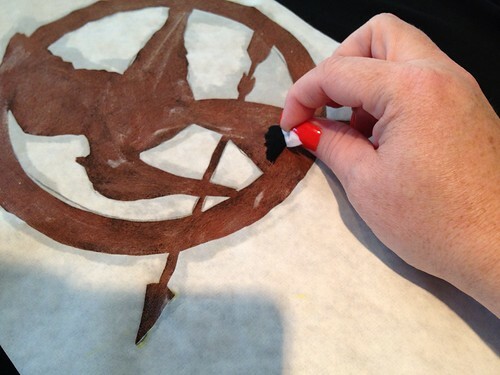 This tutorial is great because it really embraces the idea of the books and katniss' lifestyle. She hunted and searched for things and you are making your own super cool clothes. :) great job!! Now if I only had the patience to try this out lol. love love LOVE! Everyone in my house has read the whole series and loved it. This is a fabulous tutorial. I think my daughter and I will make one of these very soon! Hunger Games is excellent. I too as a parent would expect my child to ask for permission to read a young adult book , especially one with the topic that it presents ( murder). A responsible parent would read the story and decide if their child is mature enough to handle the content of the story. Anyone who would question that evidently doesn't have children of their own , or just let their children do whatever they want whenever they want. I made this for my daughter to wear for Halloween so that she could be Katniss. 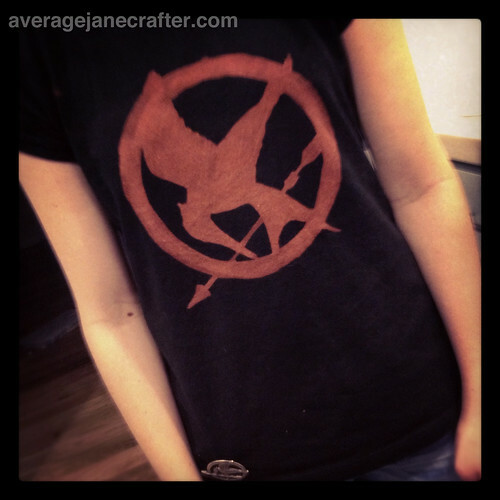 We paired it with camo cargo pants, boots and a bag that I painted "district 12" on. It turned out great! My daughter LOVES this t-shirt and she wears it all the time. Now I'm thinking about other bleaching items I could do....maybe an Owl or Lotus Flower? I need more templates!